For 34 years the Olde Towne Ghost Walk has brought scary stories to Portsmouth, and this year will be no exception. Delve into the scary stories of Portsmouth's past during this comprehensive walking tour, which spans "a 20-square block, 500 building area on the National Register of Historic Places." 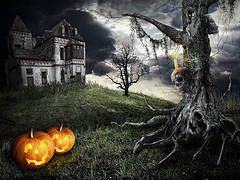 The Olde Towne Ghost Walk is no bargain-bin amusement park haunted house. On this tour, participants will encounter elaborately costumed guides recounting the stories of their haunted mansions. Tours leave from the Trinity Church Graveyard on Court Street, not too far from Portsmouth. Each 45-minute tour costs $10, and at the end of each tour, participants will be treated to hot cider in Middle Street Park. If you're curious about the history of Portsmouth, or you want to know more about things that go bump in the night, then the Olde Towne Ghost Walk promises to be a ghoulishly good time!